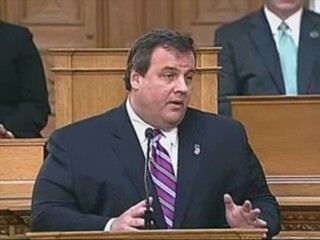 – governor christie vs. new jersey teachers | brainsnorts inc. In times of great strife, it’s not unusual for the powers that be to find an easy target at which the masses could aim their wrath, especially when the powers that be are really to blame. There is no question that New Jersey is gripped by an unprecedented financial crisis. There is also no question that Governor Christie has successfully convinced most of the state’s population that public school teachers and the New Jersey Education Association are to blame. Teachers are universally unpopular. We are disliked by kids who grow up to dislike what we tell them about their own kids. Although we are certainly guilty of being unpopular, we are not guilty of that financial mismanagement that is bankrupting the state. Radio talk shows, newspaper editorials, and letters to the editor have been crying out against the business end of education and the powerful influence of the NJEA. If you listen at all, especially to Jim Gearhart on WKXW (NJ-101.5), you’ve likely been told that too much tax money is going to too few people, specifically teachers. On a daily basis, no exaggeration, the radio is dominated with discussions about teachers whose job is too easy, pay is too high, union is too strong, benefits are too good, and pension is too generous. Governor Christie claims that all of these conditions have driven New Jerseyans down a financial dead end. Your perpetually-rising property taxes pay my salary and those of all public school teachers, but please try to remember that my property taxes are going up too. If my school budget had passed, my taxes would have increased $750, which is about a 7% jump. If my salary or any school spending goes up, it’s likely – but not definite – that your property taxes also go up. However, there are many other things driving up school spending. Did you know that textbooks cost around $150? Go into any bookstore and pick up a hardcover book that’s about the same size as a school textbook. That book is likely around $30. Why should a physically similar school book cost five times more than other books? It’s because vendors and other companies know they can bleed all kinds of money from a board of education, and the board is not spending their money. They’re spending everyone else’s money. Most teachers spend about $500 of their own money for their students each year. Teacher spending is so high that there is now a separate deduction on the 1040 tax form just for teachers. An administrator in a NJ school was buying a piece of technology called a “SmartBoard.” It looks almost like a whiteboard, but it can interact with and display a computer’s screen for a whole class to see. The school district wanted to purchase fifty boards at the catalogue price of $3,000 each for a total of $150,000. The administrator wisely decided to contact the company directly because she believed she could get a much better price if she were buying fifty. The company agreed to charge only $1,500 as a volume discount and a savings of $75,000. However, when she tried to submit the purchase, it was rejected because of something known as Ed-Data. Any New Jersey school expenditure greater than $29,500 must go through Ed-Data, a company used by the state to connect school districts and vendors. Ed-Data is nothing more than a middle man that makes money by charging fees for vendors to be part of their system and collecting a percentage of the purchase from the school district. Once Ed-Data handled the purchase of the SmartBoards, the price was back up to a total of $150,000 of your money. Gov. Christie and Mr. Gearhart have also cried loudly about the pension system that rewards teachers and other state workers at the end of their long careers. They may have cried loudly, but they have not cried accurately. Christie and Gearhart make it sound like we’re getting free money at the taxpayer’s expense, but here’s how it really works: My three highest salaries are averaged. If my three highest years are $68, $70, and $72,000 then my average is $70,000. That gets cut in half to $35,000. That’s my pension, $35,000 a year for the rest of my life. If you listen to the radio, teachers are bleeding the state dry with these exorbitant pensions. What they don’t tell you is that we pay a great deal of money for those pensions. This year $3,500 will be deducted from my paycheck and put towards my pension. That’s about 7%. So as Christie is crying that I got a 4% raise, he likely won’t tell you that I gave 7% of my salary to the state so they could invest it. So did 113,000 other teachers and about 5,000 administrators for a total of about $440 million. Each year we give the state that much money so their experts can invest it and make some money for the state until we’re ready to retire and get our own money back, plus interest. It’s no different than what any bank does with your mortgage. Unfortunately, someone in Trenton mismanaged our money. Not your money, our money. You, Joe Taxpayer, are not paying my pension. If anything, I allowed the state to make some interest in order to keep your taxes down. It’s not my fault that someone in Trenton screwed up. Aim your wrath at them, not teachers. There are alternatives to the state pension system, naturally with both positives and negatives. Let’s say I retire today after 30 years of teaching, and 30 years ago I put $3,500 into US savings bonds. Today, it would have increased about 300% to about $11,500. How many investments pay that high? After 30 years, that would add up to about $350,000 and would allow me to collect about $35,000 a year for ten years, which would be the same amount as my pension would pay me over the first ten years after retirement, carrying me from age 60 to 70 if I were to retire at 60. Here’s where it gets tricky. With savings bonds, my money is limited to the $350,000. The pension is unlimited – until I die. If I were to die before age 70, nobody is collecting my pension for me because it’s only for me, but the savings bonds are mine and can be given to someone else in my will. If I put my money into savings bonds and an emergency arises, I can cash one or more of those bonds for less than the 300%. Oh, wait. I’m a teacher. My $3,500 is going to the state, not savings bonds, and there’s nothing I can do about it. Teachers will never be rich, but they will always be safe. If you want to make big money, you go into the private sector, open your own business, risk your savings, and basically take a calculated gamble. If you want to have a safe, small, but steadily growing salary that might require a part-time job to get through the summer, you go into education. It’s delayed gratification. You forego much of a salary during most of your career, but then you cash in after it’s over with a pension during retirement. No matter how well your school district performs, you will never get a Holiday bonus. No matter how well you perform individually, your salary is strictly controlled down to the penny. Gov. Christie has “called out” teachers to take a salary freeze for next year to help offset the great property tax increases that would probably still increase even if there were no record deficit. He told teachers that if we really care about the kids, we’ll agree to hold our salaries back for one year and allow that money to be put towards schools, thus holding back another great tax increase. Unfortunately, there are two problems with that. First, can anyone guarantee that taxes aren’t going up anyway? Second, what happened back in the 90’s when the economy was booming, the stock market was flowing, and salaries were at their highest? Nobody looked at teachers and said, “Aww, I’m sorry. Our salaries are climbing thanks to this capitalist, free-market system, but yours is stuck at $27,000 because you chose a safe, steady, secure, but low-paying career. Tell ya what I’m gonna do. I’m going to take a salary freeze and give my next raise to my township in order to hold back your property taxes.” I don’t recall that happening. I would be willing to go along with the salary freeze, but what bothers me is that most of the people screaming for it are Republican Conservatives. They cry, and they have every right to cry, when their paycheck being taxed for unemployment funds, and they call President Obama’s healthcare reform as “socialist.” However, they’re in favor of taking my salary increase to keep their property taxes down, which is also socialist. That’s rather contradictory and hypocritical. If you took the risk of private employment in a democratic, free-market system, then you benefitted when things were going well. Now you are hurting because things are not going well. That was your choice, not mine. April 26, 2010 in job cuts, politics, school, school budget board of education, teachers.